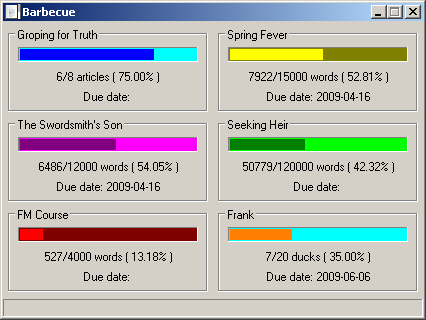 Barbecue is a free/donation program that allows you to keep track of your writing progress without having to share it with the rest of the world. It’s great for those of us without blogs or if you just need a bit of extra motivation. Want it? You can download one here. How did your writing classes go? Oooh, me likey. I put one on my blog once, and caused great hilarity when it didn't move for ages (someone mentioned something about 'a proud declaration of zero words written'). Keeping it private is how I like it.